Local agriculture and food production help support BC communities, and FBC is ready to lend a hand. For more information, contact Executive Director David Marshall. Here are examples of past projects. People in Metro Vancouver value farmland highly — and in more ways than one. An Estimate of the Public Amenity Benefits and Ecological Goods Provided by Farmland in Metro Vancouver ― published in 2009 ― found that residents across the region identified local food, green space and wildlife habitat as the top three public benefits of farmland. Respondents were asked what they would pay if invited to preserve 1,000 acres of local farmland. Across all households in the region, the public value was estimated at $58,000 per acre per year, as much as 10 times the land’s annual market value for food production. The study was conducted by agrologist Mark Robbins in collaboration with the Public Policy Program of Simon Fraser University for the Fraser Basin Council, with funding from the Investment Agriculture Foundation of BC and the Real Estate Foundation of BC. See the: Executive Summary | Full Report | Appendix - Survey. The FBC board looked at small-scale food processing during a tour of the Fraser Valley. A business feasibility study offers lessons for the future. Can fresh food be processed closer to the field? It’s a good question, especially for small producers looking to diversify. 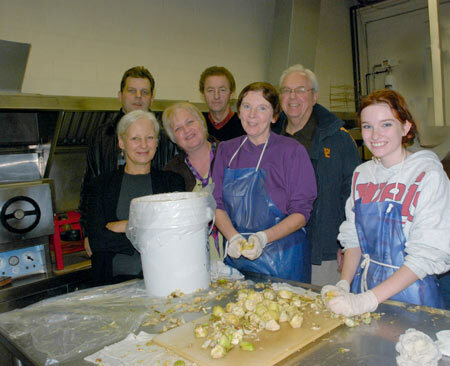 In 2007-2008 the Fraser Basin Council and the Investment Agriculture Foundation jointly funded a study on the feasibility of a shared-use facility for small-scale food processing in the Fraser Valley. Zbeetnoff Agro-Environmental Consulting and Lions Gate Consulting conducted the feasibility study in June, 2008, including a literature review, survey and interviews with 30 small processors. The study touches on the challenges and opportunities for small-scale production in the Valley. It’s worth a look for anyone with an interest in the issue: Hope Small-Scale Food Processing: Feasibility Analysis. BC farmers’ markets are very popular. There are over 100 markets in the province — about a third in the Fraser Valley. Circle Farm Tours are an innovation, offering residents and visitors opportunities to visit local producers, taste test fresh products and buy on site. FBC organized the Agassiz tour in 2004 and 2005, and the Mission tour in 2006, in partnership with others. For the upcoming season, visit Circle Farm Tours. While the Fraser Valley is one of North America's most productive agricultural regions, some practices generate pollution. Inappropriate application of commercial fertilizers or improper handling of manure from livestock and poultry may degrade soil and pollute groundwater and surface water with nitrates and phosphates. One of FBC’s early roles in this region was to facilitate a collaborative working group on nutrient management strategies and an action plan for the Fraser Valley. The project was led by the Province of BC, BC Agriculture Council and Environment Canada, with participation of agricultural producers. The process helped build a better understanding and relationship between producers and enforcement agencies. A 2001 report offered practical recommendations: see Nutrient Management Planning Strategies for the Fraser Valley. The report recommended on-site farm plans for nutrient management, which have proved successful in other jurisdictions. Ultimately, this led to creation of BC’s own Environmental Farm Plan program in 2003. The program offers practical support, recognition and cost-sharing incentives to encourage BC farmers to adopt best stewardship practices. Over 3,000 farms have since completed an environmental farm plan, and funding incentives for beneficial management practices increased in 2012. To find out more, visit the EFP website. In 2004 FBC conducted a land use survey to identify small lot agricultural producers in Kent. This was a partnership project with the District of Kent and Kent Agricultural Advisory Committee, with funding from FBC’s Strengthening Communities program and the Investment Agriculture Foundation of BC. The focus was on creating a profile of small lot agriculture in Kent and to strengthen this sector by opening up access to new markets for smaller producers. For a look at small lot agriculture and the needs of farmers in this sector, read the project report Small Lot Agriculture in the District of Kent. FBC assists educational initiatives on agriculture, including tours of national and international groups on agricultural practices and issues.